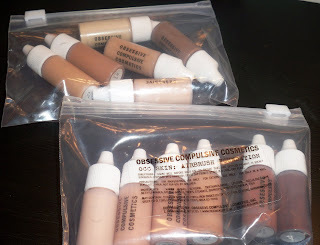 I wanted to share with you my collective haul of OCC makeup over the last few weeks. This has become one of the hottest new lines on the scene lately...I've been a bit lazy on my hauls lately, but thought you might want to see what I got. Check out the video for a thorough review! Of course I had to check out the lip tars! These are described as "A stunning new innovation in lip color, OCC Lip Tar combines the longevity of a lipstick, with the ease of application of a gloss. Goes on slick and moist, and dries down to a featherweight, long-wearing satin finish." These little glosses are jampacked with pigment! You really would only need one in a lifetime. One drop covers the lips entirely. 1) Vintage: I picked this amazing wine colored gloss to have as an edgy lip color for shoots. Can also be used to add a touch of burgundy to existing shades. I used this on a recent shoot...amazing. 3) NSFW: An amazing red, perfect for that pin up look. 4) Hush: One of the newest shades. A very opaque baby pink...looks weird on its own but would add a nice touch of pink to existing shades. 5) Anime: My fav! A super bright magenta color. It's super bold but also looks amazing on it's own. You think Pageant lip tar was bright? This one has it beat. 6) Tarred: How cool would this look on an avant garde shoot? This is also a must have for darkening existing glosses. 7) Feathered: Really bright white...use it to lighten existing shades. 8) Melange: One of the more wearable colors. A mix of pink and apricot. 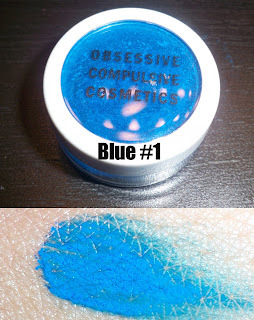 OCC is also becoming more and more known for their pigments. This is a pure pigment meaning it is insanely bright. Just check out the dry swatch below with no base. You can even thin these out and airbrush them. My girl May gifted me this even before OCC Makeup became a household name. I really wanted to try OCC Skin: Airbrush foundation. I have tried other foundation brands such as Graftobian, Temptu, and Kett. I find it more difficult to match client's skin with airbrush foundation. There's a lot more mixing involved. This is due to Airbrushing being more "new" than traditional foundation - to which there are millions of shades out there. I tried this and was surprised to see that I was a perfect match for Y3. They break down their colors into yellows and reds which is also helpful. These foundation are a bit more matte in coverage than others. 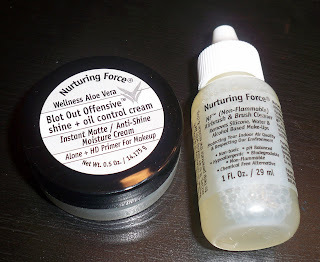 I also really want to try Nurturing Force products and was happy that OCC Makeup offered them. The first - Blot Out Offensive is an amazing primer, moisturizer and oil control cream in one. After seeing a video where Enkore reviewed it, I was sold! I even tested it on a super oily friend of mine in an outdoor shoot, and she hardly got oily! I am amazed. I also wanted to try out their airbrush cleanser. I love how it smells super minty and you only need a few drops since you can dilute it with water. Saves me from going through a lot of product. If you can, try to apply for the OCC Pro discount...honestly it's pretty easy to get and you receive confirmation in a few short hours. I got confirmation on my discount in like 3 hours! I was such a happy camper. That primer looks very promising. I may need that for myself :) I hope my airbrush foundies come soon. Can't wait to play! love this post :) i cant wait to do some hauling from them! zomg! enabler! can't spend $$$ but damn those glosses look good! That pigment swatch is amazing bright! great review...been wanting some lip tars...gotta get that discount now. thanks. Great haul! I like the lip tars. Especially Hush, Anime & Feathered. I really wanna try airbrush makeup but I saw that their kits are like $200+ YIKES! Too much for me for now. Maybe I can invest later on. oh my gosh, that blue shadow is so freakishly pretty! I'm a makeup artist that wants to buy my first airbrush kit... mostly for test shoots, brides, not really big gigs. Which do you recommend?